Like our canine guests, our felines guests also enjoy only the best in our cat boarding accommodations. Each cat or kitten can enjoy a peaceful stay with us away from those noisy dog guests as our felines facilities are well separated from our canine guests. Each feline enjoys all the comforts of home while relaxing in his own 24″x24″x48″ cubicle on a plush carpet. 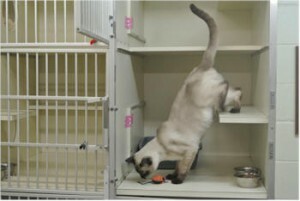 Should the cat condo facility not be at full capacity we can expand the individual units to give those boarding pets more room to climb, explore or just plain relax. We provide it all as e ach condo comes with a clean fresh kitty litter box (changed daily), fresh water and an endless supply of cat food and treats. Condos are cleaned on a daily basis or more to ensure a clean odorless environment and climate controlled with its own heating and air-conditioning units to ensure a comfortable environment. An air exhaust system ensures a constant flow of fresh air into the cattery and a medical grade air purification system helps to maintain a clean airflow. Updated shot records from your veterinarian are required covering FVRCP, Feline Leukemia, and Rabies. Rates for both cats and dogs are all inclusive covering food, bedding and the dispensing of any meds which may be needed (sorry no shots). Special food or feeding schedule, not a problem. We bill exactly like a hotel. You are always charged for the first day no matter what time you drop off your pet. If you pick your pet up before twelve noon you are not charged for the day. If you pick your pet up after twelve noon you are charged for the day. All cat boarding clients will be charged for what they sign for at the time of the pet’s drop off. Should the client return early they will be charged for the entire stay and the last day will be considered as a pm pickup and charged accordingly.